With progressive work experience, increased leadership responsibility and rising pay, Andrew Muhwezi was a on fast track to success. So, what made him switch gears and pursue a career in social enterprise as Head of Sales and Marketing for FINCA’s BrightLife? In this Q&A, Andrew reflects on his career in banking and energy, talks about his motivation for joining BrightLife, and comments on what the future may hold. BrightLife is a social enterprise by FINCA in Uganda that unlocks economic productivity and wellbeing for low income people. It does so by distributing and financing basic service products, including solar home systems, cookstoves and appliances, that improve daily life. Why did you leave a successful career in the corporate world to join BrightLife? The desire was to be a part of a great team focused on creating meaningful social impact. BrightLife offered this opportunity in abundance. I was motivated by the idea of bringing clean energy to tens of thousands of off-grid families. With BrightLife, I saw it could be done in a way that is affordable and convenient. At the same time, BrightLife offered a chance to build pathways for these families toward financial inclusion. Given my background in the banking sector, I found this to be an inspiring and noble mission. Right when I was looking to join BrightLife, my previous employer offered me a promotion to a very senior role. They were shocked when I turned it down. But, I really wanted to help build something from the ground up, putting teams together, trying and testing business models, and contributing to creating a self-sustaining entity. It is a role that I am relishing at BrightLife. How did your upbringing and career prepare you for joining a social enterprise? I spent most of my childhood with my mother—the best mother in the whole world, if you asked me! We ran a makeshift restaurant for a living in the small town of Kabale in western Uganda. By age 5, I was running a UGX 200,000 ($55) chicken grilling and juice “enterprise.” I made and sold the juice, collected the money and banked it in an account my mother had opened for me. She made it clear that paying school fees was my responsibility, so early on I learned the importance of saving. This remained the case throughout my schooling. Also, growing up, electricity and running water were luxuries for us. We had to walk some distance daily to fetch water. At night we made do with light from a kerosene lantern or candle. As you can imagine, there wasn’t much time or lighting left each day for studying. But I still had to meet my educational goals. With hard work and determination, I was able to make it all the way to university in the United Kingdom. After graduation, I was fortunate to make great professional strides. I moved through the ranks to head two multi-million-dollar businesses. These were at two top multinational corporations in the banking and energy sectors. This was priceless exposure for me to leadership, strategy, sales and marketing, and financial modeling, among others. In those roles, I was charged with starting something new in both the business-to-business (B2B) and business-to-consumer (B2C) markets. That experience has been invaluable to my ability to execute my current role at BrightLife. Having said that, there is still a lot for me to learn here. I approach my role with humility and an open mind! 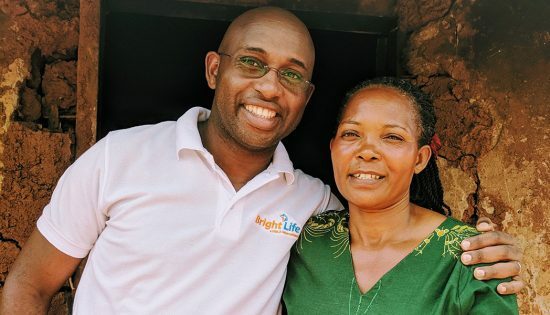 What does BrightLife’s connection to FINCA and microfinance mean for you? I am very excited about the link with FINCA. First, having been a keen follower of FINCA and its work, I greatly respect what it has achieved over the years. FINCA pioneered Village Banking™ and took it global, revolutionizing an industry in the process. 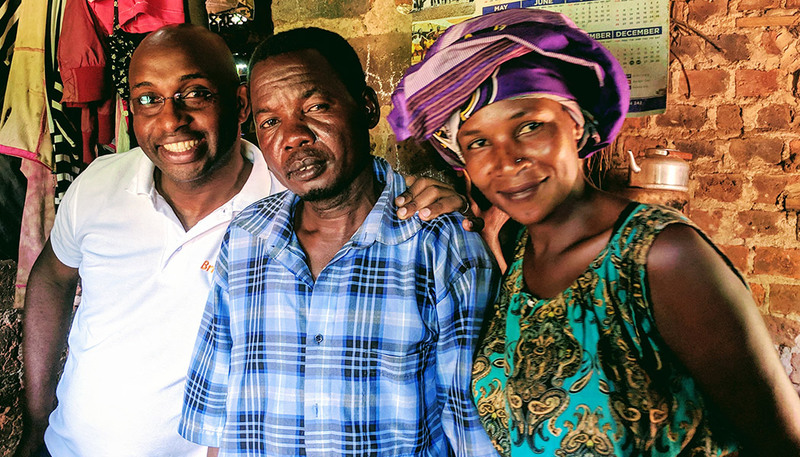 In Uganda, FINCA is a household name that resonates strongly with BrightLife’s customer base. Second, even with BrightLife’s transition to installment payments, or pay-as-you-go (PAYGo), FINCA Uganda can still be a key distribution channel. Also, the microfinance link may provide additional solutions to financing clean energy products. Third, we have an opportunity to design products that transition clients from BrightLife to FINCA Uganda, and vice versa. Together, we have all the necessary ingredients for a successful and impactful story. BrightLife’s Head of Sales and Marketing, Andrew Muhwezi (left), visiting solar energy customer, Kawuka Godfrey. What are some of the things that have surprised or challenged you in your role? Not much surprises me. I knew from day one that we would have to put in loads of effort to build both scale and scope for BrightLife. It has been a roller coaster ride, but well worth it! Introduced a PAYGo financing platform that eases the ability of our target clients to acquire our products. Partnered with Africell, one of the top telecoms in Uganda, as one of our sales channels and PAYGo partner. Recruited a team of 40 sales agents across the country and hope to double or triple this number in 2019. Established a presence in over 10 districts (4 satellite regions), making it easier for clients to find us. How do you see the solar energy market evolving over the next decade and BrightLife’s role in it? The opportunity in the solar energy market in Uganda is immense! To give perspective, Uganda has a population of more than 40 million people. Most live in rural and semi-urban areas and 73 percent of the population lacks access to electricity. Worse still, this number does not consider the fact that even those who have access experience frequent power outages. The perfect solution to this scenario is renewable energy, of which off-grid solar remains the most convenient and affordable. It gets even more interesting; BrightLife (in partnership with FIBR) recently concluded a baseline survey in Mityana district. We found that both on- and off-grid prospective clients have equal appetite for off-grid solar. This survey implies that the potential clientele for solar energy is more than 60 percent of the Ugandan population! We use a model (PAYGo) that allows poor families to pay for a solar home system in installments over time. For most people earning less than $2 a day, this model is the most affordable way to gain energy access. BrightLife product manufacturers benefit from a relationship with FINCA Ventures. Seed capital and advisory support will continue to drive production of quality and cost-effective products for clients. We want our clients to get the best products at the most affordable prices. FINCA’s experience in Village Banking™ taught us how to work with communities, women’s groups, saving and loaning associations, etc. We are fortunate to leverage a trusted brand like FINCA that has over 25 years of history in Uganda. Because of this proven track record, we can make quick inroads to communities most in need. We are cognizant of the fact that there is a link between access to energy and access to finance. While our clients seek finance to uplift their businesses and families, they equally need clean energy to be productive over longer hours and enjoy a healthy life. We are therefore able to tailor products across this spectrum and graduate clients to either side of the equation—from BrightLife to FINCA Uganda, and vice versa. This is truly special!